The city of Antofagasta is located in northern Chile, 1,100 km north of the country’s capital, Santiago. It is the capital of the second region. According to the 2017 census, it has a population of 361,873. 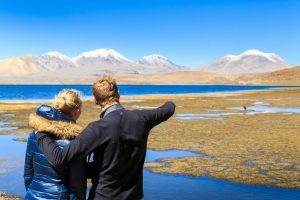 It is situated 40 meters above sea-level, in the Atacama Desert, between the Coastal Mountain Range and the Pacific Ocean; the Tropic of Capricorn passes through the northern part of the city. Its geographical coordinates are: Latitud: -23.65, Longitud: -70.4, 23° 39′ 0″ South, 70° 24′ 0″ West. Antofagasta is considered the mining capital of Chile, and also nicknamed the Pearl of the North, and the cradle of astronomy for the Southern Hemisphere. During the last decade, Antofagasta has seen steady growth in the construction, retail, and accommodation sectors, mining is its main economic motor. Originally a part of Bolivia, Antofagasta was annexed to Chile after the War of the Pacific, which took place between Chile, Peru and Bolivia from 1879 to 1883. Sovereignty was officially transferred in 1904 under the Treaty of Peace and Friendship between Chile and Bolivia. The discovery of guano deposits on the coast of the Atacama Desert kick-started the region’s economy in the mid 1800s. Later discoveries of copper and saltpeter pushed Bolivia to send customs agents to the area, and drove companies such as the UK based Melbourne Clark Co. to construct large buildings and import machinery to process saltpeter. 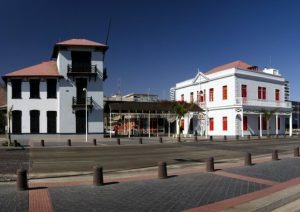 In 1869 the first city plans were laid out and further mineral discoveries gave this nascent port city a new economic boost, which in 1870 resulted in the city being officially baptized as Antofagasta, in recognition of lands owned by the son of the then Bolivian president Mariano Melgarejo in Antofagasta de la Sierra. 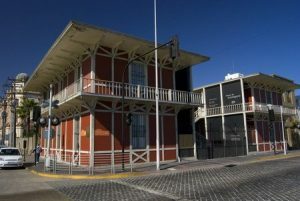 Located in the downtown area of the city, right by the ocean, the Antofagasta Regional Museum is housed in two buildings that belonged to the Chilean Customs and Port Authority, dating back to 1888. Both structures are National Monuments. The Museum opened in 2008, offering permanent, temporary and itinerant exhibits on the natural and cultural history of the Antofagasta Region, presenting its geological, mineral and paleontological characteristics, as well as the pre-hispanic population and the history of the saltpeter industry, an integral part of the region´s economy and culture. 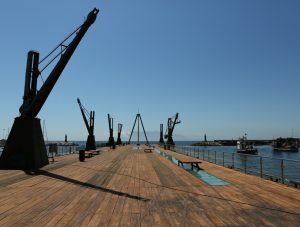 The Saltpeter Pier, also known as the Melbourne Clark Pier, is located in the Bay of Saint George (Bahía San Jorge), two blocks from Antofagasta´s main square and it dates back to the golden era of saltpeter mining in the region. Built by the Melbourne Clark Co. in 1872, its original use was to load the large quantities of saltpeter mined in the desert destined for export. It was later used to unload merchandise and receive passengers arriving to the city. On February 14, 1879, the pier was used to disembark Chilean troops right before the outbreak of the Pacific War (Guerra del Pacífico) after which Antofagasta was incorporated as Chilean territory. The pier was declared an Historical Monument in 1978 and today it is open to the public as an open urban tourist spot. Originally built in Valparaíso, it was transported vía ship to the port of Mejillones, located 65 km north of Antofagasta, where it was home to a local government office until 1888. Later the building was taken apart, and moved to Antofagasta, where it replaced the Bolivian Customs office. It operated as the Chilean Customs office of Antofagasta until 1966. 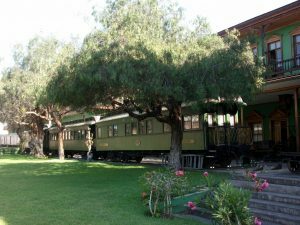 The railway company first opened in November 1888 in London, after being bought from the Huanchaca Railway Company. The company laid its first 35 km stretch of train tracks in 1873 to connect the Salar del Carmen and Antofagasta to transport saltpeter for export. It was later extended in 1892 to reach Oruro and in 1917 to La Paz, Bolivia. It now extends more than 700 km, reaching Argentina. Unlike other railway companies used for the mining sector, it survived the collapse of the saltpeter market and today transports mining products and supplies such as copper concentrate, cathodes and anodes, and sulfuric acid, for companies in the region. Internationally, the railway transports zinc and lead from Bolivia. 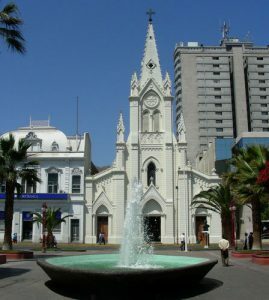 Colón Square in Antofagasta is the city’s main square, or locally known as its Plaza de Armas. 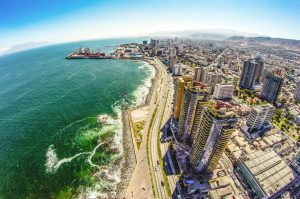 Located in the city’s downtown area, just a few blocks from the ocean, on February 14, 1879 it was witness to the arrival of Chilean troops to Antofagasta, for what was to be the start of the War of the Pacific between Chile, Peru and Bolivia. The space had been assigned as the city square in 1869, but was not yet cleared of rocks and planed until 1873. After several donations from citizens, of a central garden, 35 trees and a fountain, the square began to take shape. For a time the square was closed off with fences to prevent animals from destroying the landscaping. The Plaza Colón has numerous monuments gifted on Chile’s centenary in 1910 by the different foreign colonies that populated the city. The Clock Tower (Torre Reloj), donated by the British Colony, is considered to be a replica of London’s Big Ben, but is so only in the sound it makes. The Bandstand (Kiosko de la Retreta), also known as the Croatian Gazebo or Slavic Odeon, was donate by the city’s Croatian Colony. Legend has it that if you walk under its arch you will return to Antofagasta and maybe even stay permanently. The Statue to Spain and America (Estatua a España y América), was a gift from the city’s Spanish Colony. Constructed by Jaime Pedreny, it is a tribute to Spain and America, represented by two female figures, plus a condor, found in Chile’s crest, and a lion, for Spain. Formerly built, owned and used by the London based Anthony Gibbs & Sons, it was inaugurated in 1915. Presently, the South and West facing outside walls of the building have murals by the local artist Luis Núñez San Martin, recreating the railways of the Carmen Salt flats with different local historical figures. In the small square behind the house, Saltpeter Square (Plaza del Salitre) is a sculpture called “El Aguador” (The Water Carrier) by artists Caterina Osorio and Mario Calderón. Today a cultural center, with terraces, an amphitheater and a museum, the Huanchaca Ruins are what is left of the Establecimiento Industrial Playa Blanca (the White Beach Industrial Establishment), a metal smelting factory built by the Bolivian Mining Company of Huanchaca, together with the Antofagasta Nitrates and Railway Company, between 1888 and 1892. The factory was built to process silver extracted from the city of Pulacayo in Bolivia. In its heyday it received 200 tons of material on a daily basis, producing 3.85 tons of silver a month and employed 1,200 workers. The company, a consortium of Bolivian, Chilean and British investors, was important for the development of the city as it brought piped water from the Andes and provided a 531 km telegraph line, connecting Antofagasta with the Bolivian cities of Potosí and Sucre. Due to the instability of the price of silver in the global market and the flooding of the Pulacayo mine, the factory only functioned until 1902, when the company closed it down, leaving it in complete abandon. It was only in 1964 that the ruins were gifted to the Universidad Católica del Norte, and 10 years later declared a National Monument. 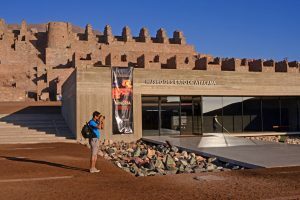 As part of the cultural center of the Huanchaca Ruins, the Museo Desierto de Atacama opened in 2010. Designed by three Chilean architects, built at the feet of the Ruins, the museum is half-buried with sunken courtyards that bring sunlight and views of the sky into the construction. 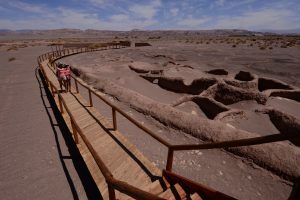 The museum has 5 permanent exhibits, presenting visitors the history of the Atacama Desert, the crucial role mining plays in the region, its geological formation to present times, when ground-based astronomy becomes an important factor. One of these exhibits is “A Window to the Universe,” designed and donated by ESO as a contribution to the Region of Antofagasta. Local artist Luis Núñez San Martin was commissioned to paint murals on the walls of the courtyards recreating scenes of the work that took place in the factory during its heyday. 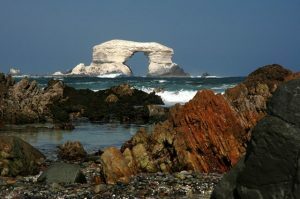 La Portada is a natural arch located on the coast of Chile, 18 km north of Antofagasta. It is one of the 15 natural monuments included among the protected areas of Chile. The arch, one of Chile’s most known geographical ‘accidents’ as it was formed through a long process of marine erosion, is 43m high, 23m wide and 70m long. Its base is made of andesite stone, surrounded by sedimentary rocks, a stratum of yellow sandstone and layers of fossils of shells that date back 35 million years. The natural monument is an observation site for birds such as the Peruvian Booby, Inca Terns, Guanay Cormorants, Kelp Gulls, Grey Gulls, Belcher’s Gulls and Pelicans. Sometimes you can spot seals and dolphins. La Portada is about 20 minutes by car from Antofagasta, on the way to the airport, and can be reached vía Route 1, the road from Antofagasta to the city of Tocopilla, where the access road diverges at the kilometer 20 mark. There is a museum and picnic areas. 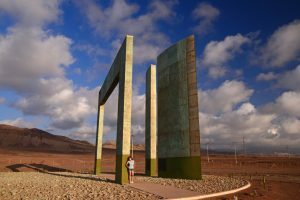 This sculpture, designed by the architect Eleonora Roman, is found 28 km north of Antofagasta near the city’s airport, to one side of the highway Route 1. The Arch of Capricorn, measures 10.4 m in height. The upper rim of the shade it makes marks the seasons in the Path of the Sun. The Path of the Sun, is 11.1 m long and 2 m wide, facing from north to south, perpendicular to the line of the Tropic of Capricorn. The Doors of the Sun, are two 12.4 m high walls, flanking the Path of the Sun, and where the shade of the Arc of Capricorn falls during the equinoxes. The Circle of the World, a 30 m diameter circumference, in which the sculpture is found and represents the earth. In the circle, the line of the Tropic of Capricorn is located 23.44 degrees from the line that represents the Equator. The sculpture is made of steels beams covered in copper, one of the most abundant minerals found in the region. 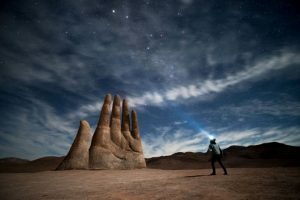 Located in the middle of the desert, 75 km south of Antofagasta, and inaugurated in 1992, the sculpture by Chilean artist Mario Irarrázaval known as the Hand of the Desert, represents “a reflection about life and death. Built at an altitude of 1,100 meters above sea level, made of iron and concrete, it stands 11 m tall. The sculpture can be accessed vía Route 26 or Route 28, which then connects to Route 5. San Pedro de Atacama is a small town located 102km east from Calama, capital of the Loa Province, in the II Region of Chile and 315 km east of Antofagasta. San Pedro is one of many oases found in the highlands near the Andes Mountains, part of the Atacama Desert. Its surrounding landscape includes desert, salt flats, volcanoes, geysers and hot springs. This small town is of great importance to Chile as it is considered the country’s archeological capital, also because of its extreme geographical position and extraordinary landscape, and its eternal blue sky. Plus, it is home to the ALMA Observatory. The town’s central square features a church built in 1774, representative of the local architectural style. Nearby, you can find the Gustavo Le Paige Archaeological Museum, named after the Jesuit Belgian priest who settled in San Pedro in 1955, which has a collection of 380,000 pre-colombian artifacts from the Atacameño culture. The town is filled with restaurants, cafés and bars. You will also find craft fairs and shops. Do not forget to look for the natural way to protect yourself from altitude sickness with coca leaves, chachacima and flor de la puna. 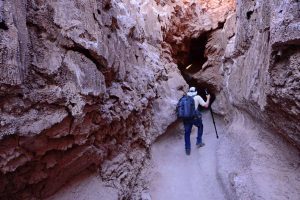 Below you will find suggestions of what to visit while in San Pedro de Atacama. Located in the Cordillera de la Sal (Salt Mountain Range), it is an extraordinary attraction because of its close resemblance to the surface of the moon, and it is an enormous natural coliseum. 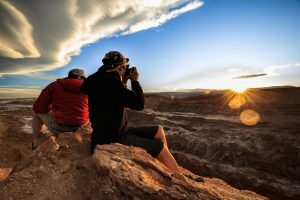 The best time of the day to visit the Valle de la Luna is at dusk, to see a spectacle of shade and changing colors. Traveling south from San Pedro is the Salar de Atacama (Atacama Salt Flat). From here you can see the Licancabur (5,920 mts)and Lascar (5,592 mts) volcanoes, among others. Toconao, located at 2,500 mts above sea level, is an old colonial village, its buildings are built entirely with liparita stone, which is of volcanic origin. At the end of the road you reach the Chaxa Lagoon, inhabited by three different types of flamingos and a large number of migratory birds. Located in the middle of the Atacama Salt Flat, is the Laguna de Cejar. Its turquoise waters, surrounded by white salt crystals, have a high concentration of salt and lithium, which make its level of flotation higher than that of the Dead Sea. Do not forget to take your bathing suit. 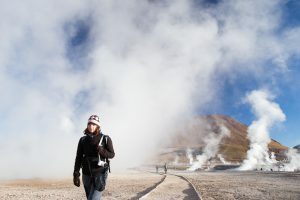 The Tatío Geysers are a geo thermal field at the feet of the Andes, at 4.200 meters above sea level. Its fumaroles are the highest in the world (4,300 mts), produced by the high temperatures inside the water filled craters, whose origins are the underground hot water rivers created by the Tatío Volcano. It is best to visit at sunrise to truly appreciate the steam rising from the depths of the earth. These hot springs (32 degrees C)are located on the way to the Tatío Geysers in the middle of a canyon. The springs are made up of hot water falls and pools of highly mineralized therapeutic waters fed by the Puritama River. Three kilometers northwest from San Pedro are the ruins of Pukará de Quitor, the center of social and political power built by the Atacameños. 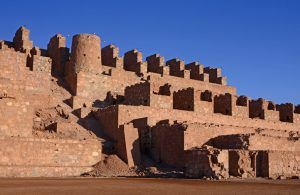 It was also used as a fortress to protect themselves from their potential enemies. 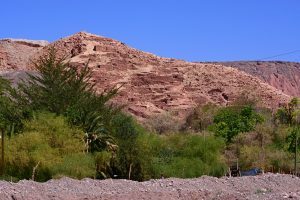 It is located on the slope of Quitor hill, along the San Pedro River. It was declared a National Monument in 1982. El Valle de la Muerte is found in the middle of a mountainous and sandy valley near San Pedro. It gets its name from the numerous animals and humans who have tried to cross it and have not survived. Proof is in the animal and human remains found on the site. To arrive, you cross the Cordillera de la Sal, a “mountain range” of natural salt made sculptures. The Miscanti and Miñique Lagoons are located more than 4,200 meters above sea level. 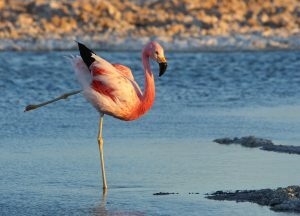 They are part of the National Flamingo Reserve and cared for by the indigenous Socaire community. The waters are an intense blue, surrounded by the white edge of the lagoon. A large variety of birds can be found nesting there. Tulor is a 3,000 year old village buried under sand, discovered in the 1950s by the Belgian Jesuit Priest Gustavo Le Paige. The village remains are an archeological and historical site. The houses and buildings are round and half buried under the sand due to the winds. The site is curated by the Coyo indigenous community, with the support of several government agencies.